Neveen Elkholy is a respectable and detailed-oriented family physician and primary care doctor serving the community of Paterson, NJ. Dr. Elkholy obtained her medical degree from University of Medicine and Denistry of NJ School of Osteopathic Medicine currently a part of Rowan University. She then completed her internship and residency in family medicine at Union Hospital, a former affiliate of Saint Barnabas Health Care System. She holds a bachelor’s degree from Rutgers, the State University of New Jersey. Dr. Elkholy previously served as a chief medical officer of Newark Community Health Centers, Inc and a co-chairman of Health and Human Relations Committee and currently serves as the Chief medical officer of Express Medical Group. She is board certified by the American Osteopathic Board of Family Physicians. 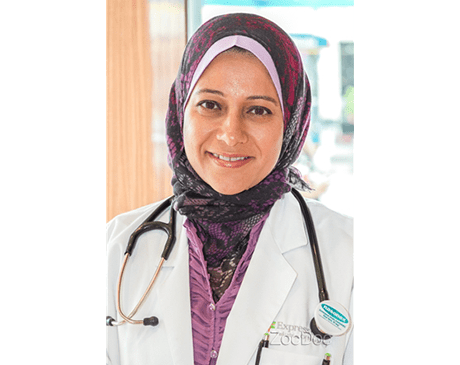 She is a member of the American Osteopathic Association, the American College of Osteopathic Family Practitioners, Egyptian American Medical Association, and the Morris County Osteopathic Society. She received the Horizon NJ Health Quality Care Recognition Award. Dr. Elkholy is trilingual in English, Arabic, and Spanish. Her awareness of these different languages makes her accessible to patients from a variety of cultural backgrounds. Patients visit her for a variety of reasons, including general consultations, sinus problems, vertigo, allergic cough, and arthritis. Dr. Elkholy welcomes patients and families of all ages from babies to seniors. She conducts her appointments with the personalized care and attention that she would expect for her own family.